The mother and grandfather of James Rice. With weeping family members and the ghostly, smiling images of three boys watching over them, city officials and elected representatives joined 100 community members on a Brooklyn street corner Tuesday evening to pledge "Not one more death." State Senator Velmanette Montgomery, Assembly member Joan Millman and representatives from the Department of Transportation, NYPD and the Brooklyn District Attorney’s joined members of Transportation Alternatives and the Groundswell Community Mural Project for the emotional unveiling of the three-story tall painting at the northwest corner of Butler Street and Third Avenue in Gowanus, Brooklyn. 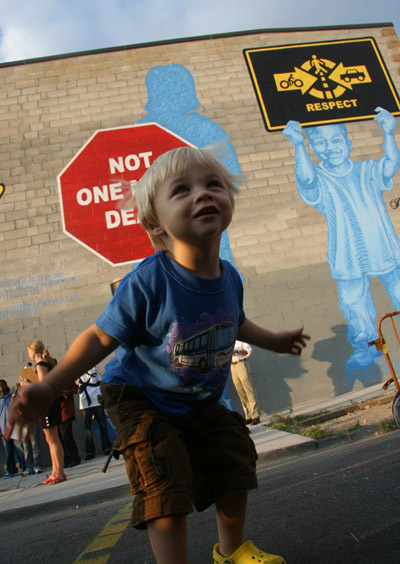 Created by a group of local teens in a summer-long collaboration with professional artists Christopher Cardinale and Nicole Schulman, the mural depicts fifth-graders Victor Flores and Juan Estrada and 4-year-old James Rice holding traffic signs designed to remind drivers motoring along dangerous Third Avenue that pedestrians, cyclists and drivers share New York City streets. The silhouette of a fourth figure, a girl, holds a stop sign that reads, "Not one more death." Flores and Estrada were killed at Third Ave. and 9th St. in 2004. 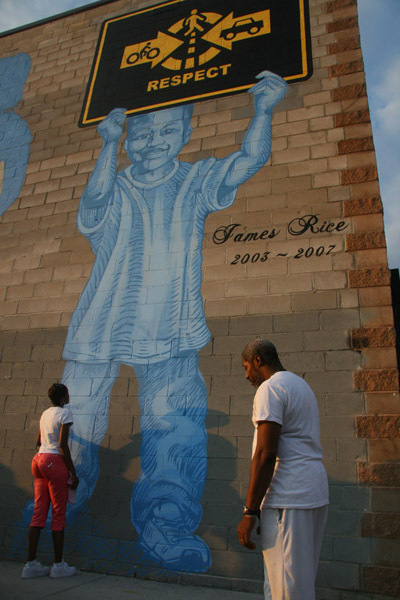 Four-year-old James Rice was run over by the driver of a Hummer just a block away from the site of the mural earlier this year. A homemade neck-down forces drivers to slow down as they turn on to Butler St. from 3rd Ave. 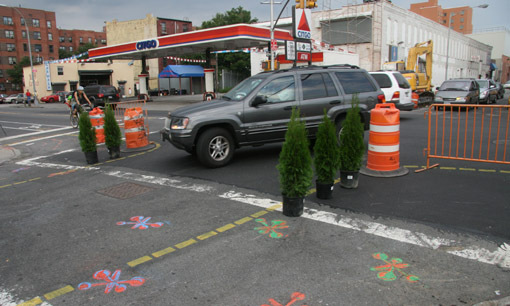 Accompanying the mural, Transportation Alternatives members engineered their own makeshift traffic-calming measures at two of the intersections along Third Avenue. Homemade neckdowns gave pedestrians a shorter crossing distance and forced motorists to slow down and drive more carefully as they turned off of Third Avenue on to Butler Street. Members of Visual Resistance, the group that produces New York City’s ghost bike memorials, reproduced the mural images as street signs and will be posting them throughout Brooklyn. Livable Streets activists conceived of the guerilla traffic-calming project after learning that DOT had failed to even begin implementing pedestrian safety measures on Third Avenue despite a 2004 pledge by former Commissioner Iris Weinshall that $4 million in capital improvements would be completed by the summer of 2006. DOT sent a high-level emissary to let the community know that their message had been received. 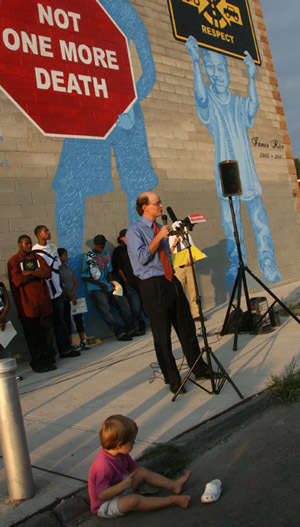 Senior Policy Advisor Jon Orcutt said DOT "commends and endorses" the message of the mural project. He used the opportunity to announce that the first phase of construction projects emerging from the ten-year-old Downtown Brooklyn Traffic Calming Project had begun and "is a top priority for DOT Commissioner Janette Sadik-Khan." DOT is working with the City’s Department of Design and Construction to install neckdowns, sidewalk extensions and bus bulbs at 95 street corners throughout Downtown Brooklyn at a cost of about $5 million. The long-sought pedestrian safety measures "represent a concentrated, area-wide effort that is unprecedented in scope and approach for city government traffic calming efforts," Orcutt said. Wow, that first picture that is kind of a tear jerker. A towards zero deaths initiative is long overdue. page 3. Although it has kind of flatlined in the last few years. Last year 162 pedestrians were killed in NYC, which means someone dies on our streets almost every other day. Sure, that’s a significant improvement from 20 years ago when fatalities were a daily occurrence, but it’s still a far cry from zero. London has set targets to reduce pedestrian injuries and fatalities and is seeing better results than we are. It’s about time NYC did the same. Al: The long-term drop in pedestrian deaths, such as it is, is probably due in significant part to neighborhood pressure on DOT and, in the absence of DOT action, traffic-calming measures taken by fed-up local activists. Your comment sort of makes it sound like the deaths are on some kind of natural decline–that the figure is declining by itself. DSM – “is probably due”? is this just wild conjecture because your gut instinct is to give DOT no credit for anything, or does it have any basis in fact whatsoever? if the latter, could you share these facts with us? i mean, are you even familiar with the safety work DOT has done over the past decade? otherwise you’re just arguing in a vacuum. Sure, DOT deserves credit for pedestrian-sensitive projects over the last decade, but my impression has been that they have been dwarfed by pedestrian-hostile ones. The latter tend to be major capital projects – flyovers, bridge rehabs, street widenings, etc., while the former tend to be small and scattered. The overall legacy of DOT has been disregard of neighborhoods, parks, aesthetics, historic integrity. Hoping that will change and we can see DOT as the agent for positive change in the environment, look, and life of the city. well, all i would say is that safety improvements can come in a variety of forms (markings, signage, signal timing adjustments, etc) besides high-profile capital projects, and i think many of dot’s safety interventions are not widely known, but are responsible for at least some of the decline in ped deaths & injuries. Kudos to all those involved in creating the mural. It’s a fitting tribute to Victor, Juan and James, and I hope will help save lives. Unmentioned at the dedication ceremony, though, was the fact that Whole Foods is intending to build a large store at the corner of 3rd Avenue and 3rd Street, just a few blocks from where the mural is located, with a whopping 420 parking spaces and absolutely no plans to try to encourage alternate modes of transportation to and from the store. They’ve stonewalled community organizations that have called for jitneys to transit locations, ample covered bike parking, and delivery service. Our elected officials need to pressure them now – before they start building – to include sensible, pedestrian-friendly measures. Whole Foods usually seems responsive to local community needs and will most likely succumb to suitable pressures. Even better, if they were to use their creative talents and extensive resources to figure out and employ much more suitable ways to get people to and from their stores. UPS came from Macys many years ago and they even had electric trucks. Whole Foods can do a lot better. Whole Foods can definitely do a lot better, but I’m afraid that they do a great job of talking the talk but not walking the walk. I think the recent revelation of their CEO’s anonymous pumping of Whole Foods’ stock while trashing competitors (one of which he wanted to buy) is how they really do business. Elected officials need to step up and pressure them. Why would Whole Foods need parking there, when the Union Square store has none (as far as I know)? Was the parking perhaps a requirement of the zoning?? That was the case with Target on the Harlem River in the Bronx — and the parking has turned out to be underused. One of Target’s most profitable stores, it is largely transit-dependent. With luck, Target’s parking lot will one day be put to better use in conjunction with development of the waterfront and greenway (giving it the potential to become a really powerful multi-modal transportation destination delivering more customers than a parking lot). In any case, I find it hard to believe that Whole Foods’ customers intend to drive into that neighborhood. Good question, and my point exactly. Whole Foods is all about a suburban model, and they love lots of parking. Actually, that site is zoned M-2, manufacturing, and it allows for a maximum of 10,000 square feet of retial space. They’re conforming with (read: circumventing) the zoning by building 87% of the store below grade, along the banks of the Gowanus Canal, in the flood plain, on a site that in some places sits only three feet above sea level, and is heavily polluted. But that’s another story. Whole Foods’ Manhattan stores have zero parking, and Manhattan car ownership is about 18% of households. The store they want to build in Darien, CT, would have 350 parking spaces, and Darien has 97% HH vehicle ownership. So one would think that in Brooklyn, with roughly 50% HH vehicle ownership, the number of parking spaces would be somewhere in the middle. But their plan calls for 420 spaces. Essentially, they want to saddle Gowanus, Park Slope and Carroll Gardens with all the traffic from customers in Bay Ridge, Bensonhurst and Marine Park. Which is not to deride those fine neighborhoods in any way, but to point up the folly of Whole Foods’ plan.